London and New York: Routledge 2018. xiii+203pp. London and New York: Routledge 2018. x+193pp. Tome III: Index of Subjects. London and New York: Routledge 2018. x+106pp. This last volume of Kierkegaard Research: Sources, Reception and Resources is a cumulative index to all the volumes of the series. The series was originally designed in a systematic fashion in order to make it as easily usable and accessible as possible. The individual parts of the series and the individual volumes have been organized to make it generally fairly simple to locate the main articles relevant for one’s research interests. However, the placement of some individual articles might not always be completely self-evident. Moreover, the sheer mass of material and information provided by the series makes a cumulative index a necessary accompanying resource. Further, given the scope of the series, it was inevitable that some names or topics are mentioned more than once in the series in different places beyond the main article ostensibly dedicated to them. 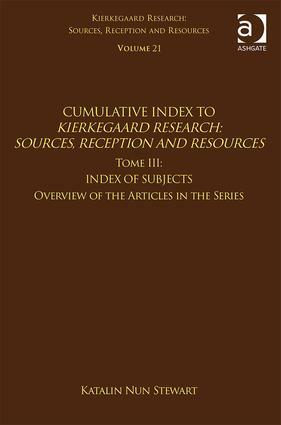 The purpose of these indices is thus to help the readers to find an easy and direct way to the topics of their interest in the rich universe of Kierkegaard research. 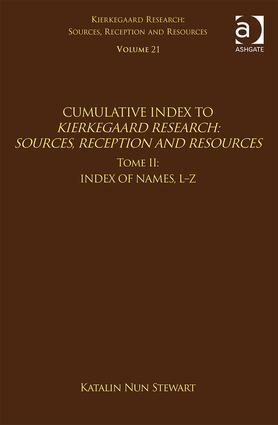 The material of the indices is divided into three tomes: Tome I is the Index of Names, A–K, Tome II covers the Index of Names, L–Z, while Tome III consists of the Index of Subjects and includes a complete overview of all the volumes, tomes and articles of the series.